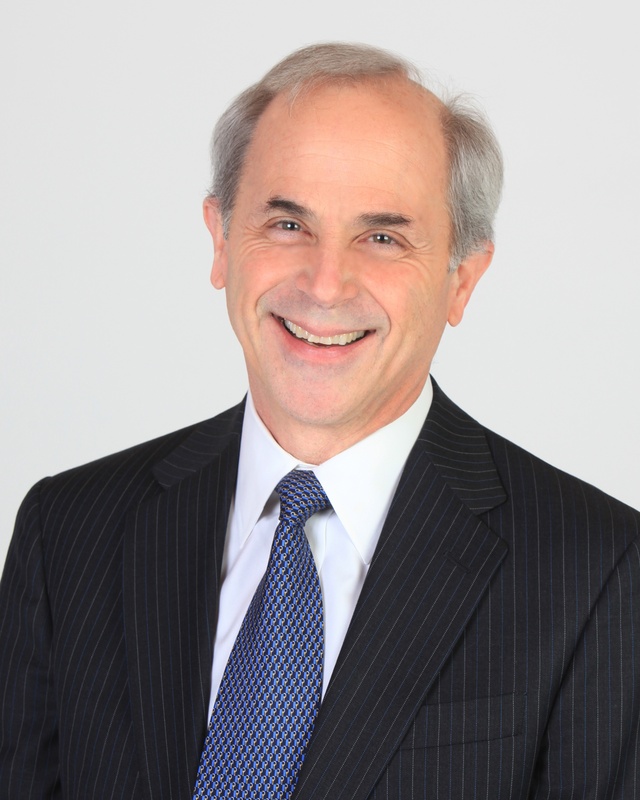 As winner of the Southern Arizona CCIM 25th anniversary Commercial Real Estate Forecast, Rick Kleiner, top-producing C&W | PICOR broker and principal, addressed the audience. What follows is the transcript of his remarks covering the top three office transactions of the year, as well as select slides. As I’ve considered what I could possibly say to this exceptional gathering of colleagues (1), I’ve been reminded of a favorite saying by Mark Twain, “It is better to keep your mouth closed and let people think you are a fool than to open it and remove all doubt.” While that thought may best belong with some of our presidential candidates today in New Hampshire, I’ll press ahead. At this late hour, I’m not going to talk numbers and statistics. Instead I’m going to talk Big Deals. 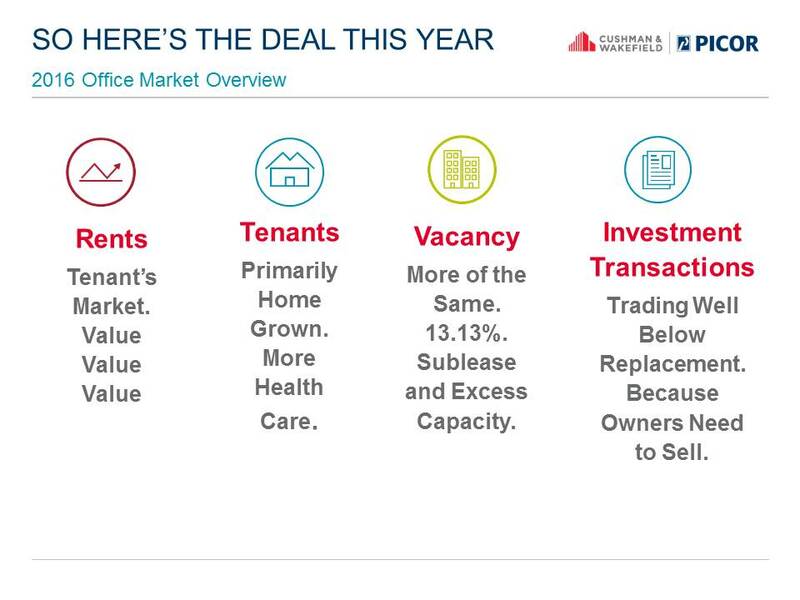 Relax, it’s not a Top Ten list, rather it’s my own personal take on the top three office transactions of 2015. I’ve had to make some tough choices and you may have your own favorites which didn’t make my cut. But my hope is that you’ll find this kind of fun to peel back the onion a bit, talk about some background details and see what made these deals tick. And I think we’ll see some shared characteristics among them. 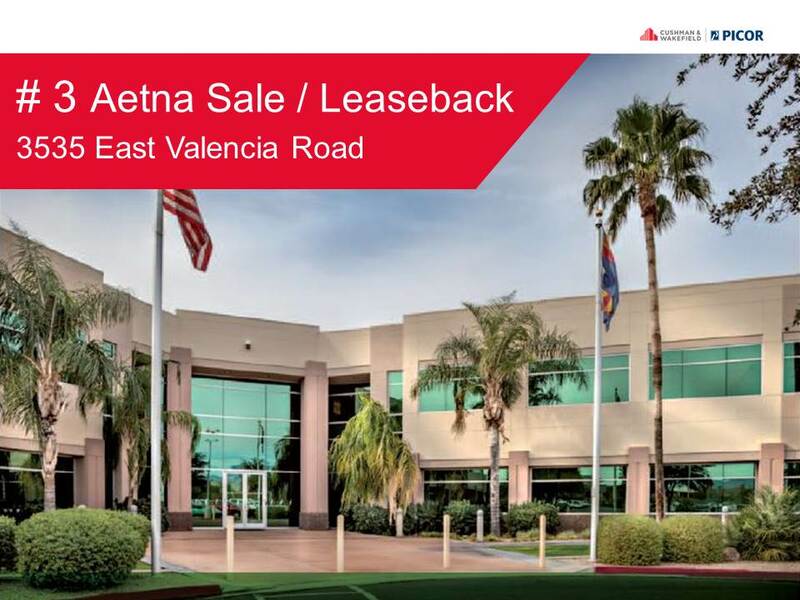 First let’s take a look at Deal #3, the sale/leaseback by Aetna at 3535 East Valencia Road. You’ll see key deal terms are summarized on the screen so I won’t repeat them. As the Tucson member of the national Cushman & Wakefield Capital Markets team that brokered the deal, my takeaway was that this transaction was 1) fueled by the significance of Aetna and 2) by the relationship of the players. Buyer Griffin Capital, based in El Segundo CA, closed on nearly $1.2 billion in acquisitions in 2015. Griffin was among a handful of significant investment groups that were jockeying for the inside track on this purchase. All of these groups were well known to one another and none of them wanted to lose this deal. In the end my C&W team was able to negotiate favorable terms for Aetna in both the lease and the sale through knowing the hot buttons of the prospective buyers and how to reach an outcome that worked for both sides. 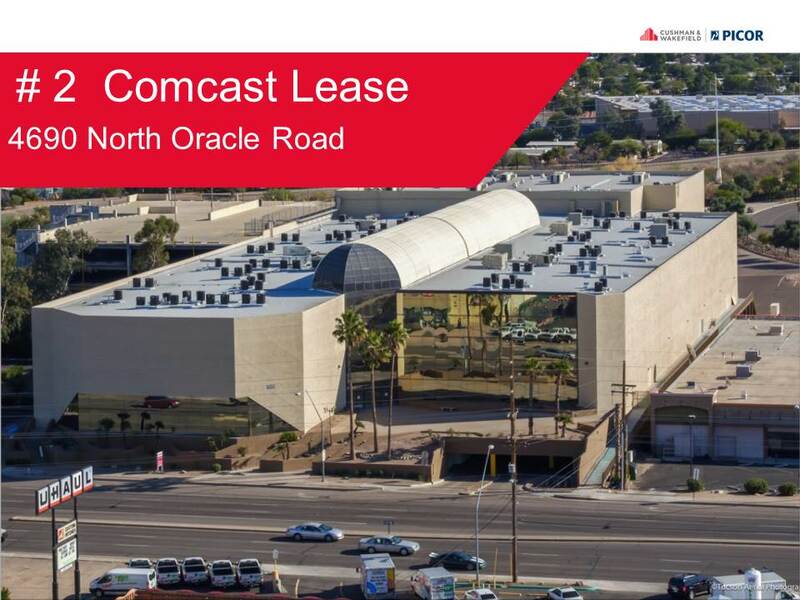 Moving up, let’s look at Deal #2, the Comcast Lease at 4690 North Oracle Road. Weighing in at 211,152 SF, the sheer size of this deal breaks the scales. Ranked 43rd in the Fortune 500, new tenant Comcast said after this deal was signed that this is the top of their list of best locations in the country. As you know, an enormous wealth of amenities sits nearby for the 1,125 employees, from the Tucson Mall to the Rillito River walk. Not to mention the 1,000 covered parking spaces in the adjacent garage. For those of us who remember this building as the Galleria filled with retail shops and later home to American Home Furnishings, this is a wonderful almost-fairy tale ending for an owner who stood by – and with -- their property, vacant since 2008. And as you see, the positive economic impact for our community is enormous. Now if you’re thinking about your own Big Deal for 2016, please talk with Greg Furrier during Happy Hour. Greg, where are you? Greg’s secret is that this property is available for purchase, around $40 million. If you can broker that deal, I’m sure we’ll be talking about you next February on this podium. 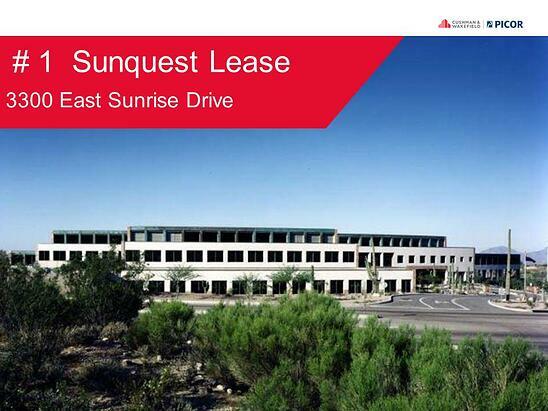 And now my #1 Deal of 2015, the Sunquest Lease at 3300 East Sunrise Drive in the former national headquarters of Muscular Dystrophy Association (MDA). How many of you had a chance to tour this building while MDA was in residence? I think you’ll agree that it is perhaps the most stunning office building in our entire city due to its location, architecture and the craftsmanship of its construction. In early 2014 when I was representing MDA for sale of the property with my Chicago Cushman & Wakefield co-broker, we hoped this extraordinary building would again become home to a national class-A tenant. We found a Class-A buyer, Larsen Baker. And I’m told that when Larsen Baker closed its purchase in March 2014, Mark Irvin said to George and Don that Sunquest would relocate there. How remarkable for everyone involved that this story came to pass. I understand it wasn’t exactly a straight line, what with 15 months and 3 walkaways in the lease negotiation. The current issue of BizTucson has a feature article about Sunquest in which its president Matt Hawkins says this move is an “investment in the company’s employees and demonstrates the company’s commitment to Tucson.” The article also features a wonderful quote from Don Baker in which he says that the “…decision to buy this building was based on our faith in Tucson.” I know that I speak for all of us to say thank you, Don and George and your team, for that faith and vision. I said in my introduction that I think we’ll see some shared characteristics among these Big Deals. And here are my conclusions. While we know that time too-often works to our disadvantage, the tempo of these transactions reminds us that the Outstanding Deal will find a way to happen when smart and capable people are there to guide things along.